As the mass of the entire human race continues to be reproduced in plastic each year, our incapacity to ‘re-circulate’ these materials has lent itself to the cumulative growth of micro- and macro-debris – inducing mechanical and chemical external costs on the global economy. The divergence between the growth in demand for packaged goods and the rate at which plastic treatment infrastructure is increasing has engendered a large “plastic-waste-leakage problem with a matching growth trajectory”, according to the Ocean Conservancy. Any potential solutions to this ‘global problem of plastics pollution’ derive from either disincentivising plastic production or mitigating the externalities that result from plastic waste. 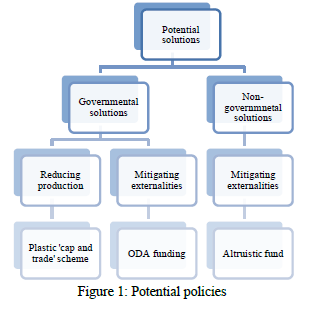 This essay concerns itself with three potential policies – a ‘cap and trade’ system, ODA-funded interventions and charity funded interventions – summarised in Figure 1. Whilst Schumpeterian developments in technologies often mean that ‘the most effective solution’ is quickly changing, Economics provides a time-invariant methodology for identifying and allocating funds to the solution which is most efficient at the margin. Through the use of a standardised metric, we can determine which of these three popular policies is the most cost-effective. This will ensure we yield the highest environment returns – in regards to plastic waste reduced – from our scarce resources. In determining the appropriate standardised metric, insights from behavioural economics and the ‘MPG illusion’ suggest ‘tonnes of plastic waste reduced per dollar’ is preferable to ‘dollars per tonne of plastic waste reduced’. 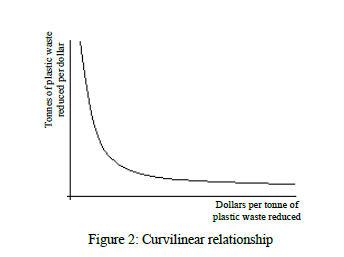 Psychological heuristics lead people to think that ‘plastic waste reduction’ decreases as a linear function of ‘dollars per tonne of plastic waste reduced’ – unaware of the true curvilinear (inverse) relationship between the two variables as described by Figure 2. Imagine a fund collects $20,000, which it uses for two interventions, each of which have ‘room for funding’ of $10,000. It first funds a programme which requires $15 per tonne of plastic waste reduced, before giving the remaining funds to a scheme needing $50 per tonne of plastic waste reduced. The charity then has the opportunity to invest either in a piece of technology which would improve the cost effectiveness of the former intervention from $50 to $35 per ton of plastic waste reduced, or in another piece of technology which would increase the cost effectiveness of the latter programme from $15 to $12 per ton of plastic waste reduced. Whilst our cognitive biases may indicate otherwise, Figure 3 holds that the first technology would reduce plastic waste by 86 tonnes whereas the second technology would rescue 166 tonnes. The unit, ‘dollars per tonne of plastic waste reduced’ seemingly understates the environmental benefits of further reductions in the dollar cost of decreasing plastic waste for interventions that already operate at a low cost. It also overstates the potential returns of reducing the cost in ‘dollars per tonne’ of those interventions that are initially more unproductive. While the difference is subtle, ‘tonnes of plastic waste reduced per dollar’ more effectively signals the returns of our three proposed solutions. This unit may also ‘nudge’ innovators towards developing technologies that yield higher environmental dividends. One solution, with potentially high marginal outcomes, is an international ‘cap and trade’ scheme for plastic production permits, analogous to the Kyoto Protocol. Coase Theorem indicates that reductions in plastic production will be made by those firms who will suffer the smallest losses. Assuming negligible transaction costs, there will be allocative efficiency irrespective of the initial distribution of the permits – though certain allocations may lead to equity issues. Whilst a direct control on overall plastic production seems rewarding, significant implementation and monitoring costs1 may dilute the policy’s overall ‘tonnes of plastic waste reduced per dollar’ ratio. Also, without a global enforcement mechanism, the private nature of the costs, yet communality of the benefits, will lead to the anarchical tendency for countries to leave such non-binding agreements and ‘free ride’ on others’ efforts. This ‘incentive incompatibility’ between inter- and intra-national interests can also be explained by Public Choice Theory. Self-interested government officials, who are primarily concerned with ‘electoral survival’, will have minimal incentive – omitting reputational interests – to engage in policies that benefit those outside their democracy. Yet, even if a legally binging arrangement was ratified, Stern (2015) holds that this would have the unintended consequence of reducing “collective (environmental) ambition… because of perceived inequality”: developing countries would be unable to use the same industrial levers to growth as did the now developed nations. Therefore, a global treaty may generate little environmental value – in terms of reducing plastic production – per unit cost. Another governmental solution – advocated by the OECD – is to use aid as a means of financing waste treatment infrastructure, in order to offset against the externalities that arise from plastics pollution. Programmes funded by ODA – especially if it is multilateral – are likely to benefit from the cost-effective pooling of capital. That said, Public Choice Economics again highlights that the ‘tonnes of plastic waste reduced per dollar’ ratio may be perceptibly lower than expected. Whilst donor countries retain sovereignty over the allocation of their ODA contributions, officials will continue to trade funds in return for political capital rather than trying to maximise the ‘WALY per dollar’2 (or in this case, the ‘tonnes of plastic waste reduced per dollar’) ratio of their aid budgets. In 2017, for example, the Foreign Office was accused of redirecting £700m of aid towards a ‘pro-democracy’ initiative among the Baltic States to further its foreign policy objectives, despite the recipient countries being ineligible for ODA. Finally, a Global Plastics Altruism Fund – de-politicised and transparent – may be a suitable non-governmental solution to funding unprofitable plastic-waste-reduction interventions. Whilst there are constraints over ODA flows, an altruism fund would enjoy much greater financial flexibility over its reserves. For instance, if it were deemed cost-effective, the donations could be used as prize money in academic competitions, fostering innovative proposals from the economic and scientific community. On the other hand, if data reveals that a public policy – such as an extended producer responsibility scheme or a Pigouvian tax on plastic production– has superlative marginal returns, then funds could even be used to lobby governments into taking such actions. However, this altruism fund would be one of many plastics charities already in operation. To avoid a duplication of efforts, there may be a more efficient pooling equilibrium if all the funds could be gathered together – such as through multilateral aid. This may in fact lead to a low ‘tonnes of plastic waste reduced per dollar’ ratio for a charity-funded solution. One additional point to note is that it may be valuable to use both aid-based funding and donation-based funding as potential avenues for the financing of plastic-related interventions. 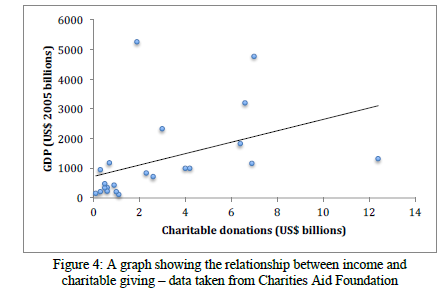 A plot of real GDP against donations – as in Figure 4 – reveals that charitable giving has the characteristics of an income inelastic normal good. This indicates a policy to increase government revenues and thus ODA funds – such as a rise in income taxes – will reduce philanthropic donations by proportionally less than the fall in disposable incomes. Thus, governments are able to expand their ODA budgets without significantly crowding out funds available to private charities. Even in the presence of normative disagreements over policy, the economist's methodology of drawing from theoretical frameworks across the field of the subject and combining it with statistical rigour allows for a methodology to strive towards a solution where politics alone has failed. By applying the ‘nudge-inspired’ metric of ‘tonnes of plastic waste reduced per dollar’ and ascertaining a database for all possible costs – and potential revenues – of the three discussed policies, the most cost-effective route can be identified. This systematic approach is essential in generating as much environmental value as possible and, indeed, answering the ‘global problem of plastics pollution’. Ocean Conservancy (2015) Stemming the Tide: Land-based strategies for a plasticfree ocean, : McKinsey Center for Business and Environment. Thaler, R. H. and Sunstein, C. R. (2009) Nudge: Improving Decisions About Health, Wealth and Happiness, England: Penguin Books Ltd.
OECD (2018) Improving Markets for Recycled Plastics: Trends, Prospects and Policy Responses, Paris: OECD Publishing. at: https://www.theguardian.com/politics/2017/feb/13/boris-johnson-criticisedsiphoning-off-from-foreign-aid-budget-ukraine-gambia-ghana (Accessed: 7th July 2018). Stern, N. (2015) Why Are We Waiting? The Logic, Urgency, and Promise of Tackling Climate Change, Massachusetts: The MIT Press.